We’ve covered the best dog crates and we’ve also written a quick guide on where to put the dog crate and in this guide we will discuss what to put in the dog crate. To make crate training work you need to make the crate somewhere they will feel warm, safe and happy. You adult dog or puppy may spend a lot of time in the crate and as such it should be made to be as comfortable as possible and by making sure you get the right stuff to put in the crate this can be made a lot easier. But what to put in a dog crate exactly? What are some of the best things to put in there and what items should you try to avoid? The Jug Dog writers are here to help you find the right things for your dog be it adult or puppy. This guide will cover bedding, toys (toys for aggressive chewers), food and water as well as a cover (if you need it). This is a guide and some advice and you should always make sure to do what’s right for your dog and your situation, use your best judgment! Why put a kong in a dog crate? Why put a nylabone in a dog crate? Why put a snuggle puppy in a dog crate? Typically, dog crates have a solid floor and may not come with any bedding – if this is the case you will need to buy some bedding to put in the dog crate. There are many types of dog crate bedding out there and many may not be right for you while others will be the perfect solution. If your crate is spacious enough you can fit in a ‘normal’ dog bed inside the crate. They’re designed to be comfortable and are shaped in such a way that the dog can fit in snugly. This is a versatile option as you can easily take it in and out and can be used inside and outside the crate. This a more expensive option than some of the others, perhaps, but they work well. If you have a puppy they may chew this bed and rip it into pieces, if you have a puppy consider another option mentioned later. Blankets and towels should be considered if you have a well behaved dog who isn’t destructive. Dog blankets and towels can be ripped to shreds by boisterous, chew-happy dogs and puppies but are a cheap option if you don’t have one of these types of dogs. One of the best features of dog blankets and towels is that they are easy to clean and can be a very cost effective choice of what to put in a dog bed. A crate mat is a popular choice as it’s a cross between the classic bed and blankets and towels. Often, dog mats can be measured to be the exact size of the bottom of the crate. Just be sure to not get a soft or stuffed crate mat for excitable chewers as it will be destroyed before you know it, a durable and washable crate mat should be considered such as the Vet Bed. Ok, so you’ve put the crate in a great location, put in a nice comfortable bed and now you want to make sure your dog isn’t bored. The best way to make sure the dog isn’t bored is with plenty of mental and physical stimulation outside of the crate and something to keep them busy inside of the crate, especially if they’re only getting used to crate training and they’re young. However, please be warned that while they’re in the crate they may not be under constant watch by you or a guardian and not all toys are suited to be put in the crate. You may have seen our resident Jug with a kong toy. 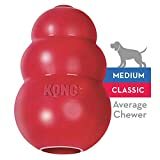 A kong toy is a highly durable toy which can be used to ‘hide’ food and treats inside, the toy works as a puzzle as the dog can’t get the contents out easily, in some cases it could take hours for the dog to finish up. In this time the dog will be completely distracted and having to use their wits to get everything out. The Kong toy is highly recommended and safe to put in the crate, they will either spend ages working on it or fall asleep trying. Perfect! Nylabone is another safe solution for what to put in a dog crate. Nylabones are flavoured chewable bones which don’t splinter like many dog chews and come apart. Nylabones are also made to be quite tough and will take days or even weeks to make a dent in them. 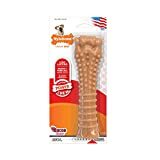 Nylabones come in puppy friendly form and for adults so make sure to browser and choose right ones. 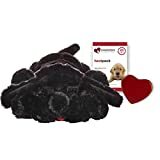 A snuggle puppy is a soft, durable toy which can help very young pups get used to their new home. They can simulate being with their litter mates as it has a built in ‘heartbeat’ and it can be warmed up. The snugglepuppy can be a great way to soothe a new arrival who will be crate trained. Please take note, this is a toy to be used with very young pups who haven’t got strong enough jaws and teeth to shred it apart. This is not an ideal purchase for an adult or a strong chewer at all. Now this option isn’t for all dog owners as having toilet training aids in the dog crate won’t teach them to not soil the crate. In fact, it may do the opposite as the dog will learn that’s it’s ok to do a poo or a wee in the crate – if you’re like us then you will be wanting to use the crate as a safe place and they should still do their business outside or somewhere else. Remember, dogs are den animals and soiling their own den is not something they want to do. You can read more about this in our training page. However, if for whatever reason having a small area in the crate to their business is what you want then you can’t go wrong with puppy pads. 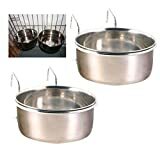 Similar to toilet training aids, food and drink bowls inside a crate may not be the best option especially for puppies. The ideal scenario is to not put a dog inside a crate who is hungry or thirsty and who hasn’t been to do their business for a while. Giving them a reason to want to go for a wee or a poo inside the crate is a bad scenario for both you and the dog. However, if you have an adult, housebroken dog this may not be a problem. If you know your dog well and this is the route you want to take we recommend crate designed dog and food bowls which attach to the sides and reduce the risk of spillage, spillage can be a nightmare for a dog who may have to suffer on a damp bed for a long period of time. Take this into consideration. If you have a plastic of fabric crate we wouldn’t recommend a food and drink bowl at all. There are plenty of different options out there to fill your dog’s crate with great products to make it comfortable and warm and most importantly, safe. Just remember that not all the products we’ve selected are right for all dogs, ultimately it’s up to you to choose what’s right for your dog.